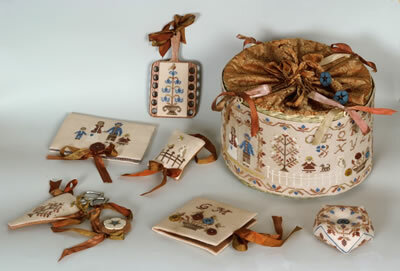 Dedicated to my beloved and unforgettable friend Kris Stott (Norden Crafts), this basket and stitcher’s sewing accessories represent a loving family, house and pets, flowers and trees in an antique sampler style. While we attended the 2009 Nashville show, Kris showed me the lovely baskets of Lantern Moon and we chose together threads and ribbons for a new model she wanted me to design for the basket. The beautiful Gloriana threads were perfect for this basket. I found the beautiful hand-dyed linen fabric from R&R and my friend Cecile helped me to find the right JAB buttons for this set. Cecile even made a set of JAB pins for this design. Therefore, what you see is the result of all this collaboration and love for Kris and her family. Basket: Round Drawstring Basket 2-3472 terracotta 9 in diameter from Lantern Moon. List of finishing materials to purchase: three Cherry Tart #128 pure silk ribbon, 13 mm from Gloriana, Skirtex, interfacing, Iron On Adhesive, quilt cotton batting, Emery Needle Polisher from Nordic Needle, 18 x 11 in (fat eighth) Wool Fabric Collection 2254 Cinnabar from Weeks Dye Works, four small bone rings ¾ in /8 mm diameter, small amount of fibrefill, matching sewing polyester thread, acid free stick glue, Tacky Glue, fabric glue. Chart pack includes designs charts and instructions for stitching and finishing the basket and the sewing accessories.